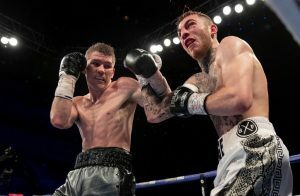 In his first fight in Liverpool for almost three years, former WBO junior-middleweight champion, Liam Smith made easy work of Sam Eggington, stopping the former European welterweight champion in five rounds to claim the WBC ‘Silver’ belt and hopefully send a message to the rest of the 154lb division. ‘Beefy’ Smith took the front foot immediately and dominated the early rounds, sticking Eggington in reverse and a small cut that that opened up on Sam’s right eye was the early signal of Smith’s dominance. There was nothing fancy in Liam’s display but the speed of which he threw his punches and the power that went into them were clearly far too much for Eggington to keep the bout competitive. ‘The Savage’ seems to know no other way of fighting, whether on top or in adversity, Eggington wants to swing, wants to fight, but Smith was too much. It proved as in round five, with his opponent stuck in the corner, Smith landed power shot after power shot without reply until the referee decided enough was enough and ended the main event. ‘‘Shot wise I was good, accuracy wise I was sloppy at times, my footwork.’’ Smith, now 27-2-1 (15KOs) said post-fight. ‘‘I didn’t really have respect for Sam’s power, I put it down to that. Having held a world title at 154lb and, losing out to Mexican Jaime Munguia for his old belt last year, the target for Liam Smith must be for another shot at the championship belts before the end of 2019. A domestic dustup that promised much and certainly delivered saw Scott Fitzgerald drop Anthony Fowler en route to a split decision victory in a fantastic 10-round bout. It slowly but surely turned into the biggest fight of the card, even overshadowing tonight’s main event, but when junior-middleweight and domestic rivals, Fowler and Fitzgerald entered the ring, the atmosphere in Liverpool was palpable. It was an intriguing battle for the middle of the ring in the early rounds, with both fighters mirroring the other for punches thrown, although Fowler’s variety of shots seemed more likely to appeal to the judges. But Fowler, 9-0 (8KOs) heading into tonight, suffered through the middle rounds, appearing to tire as Scott began to get more efficient with his punches. Anthony unleashed a barrage of punches in the 9th that clearly affected Fitzgerald as Scott threw very little for the rest of the round. As volume from the crowd increased, as did Fowler’s attack. The scouser began to have his hands low and felt more comfortable throwing but it wasn’t enough to get his opponent out in that particular round. With just over a minute to go of the 10th and final round, Fitzgerald unleashed a power shot selection that dropped Fowler, and as we were to find out, the 10-8 round was crucial. The final scorecards were,96-94 for Fowler and 95-94 (x2) for Fitzgerald. ‘‘He’s a tough, big, strong man who just doesn’t stop coming forward… I could hit him with a bat he’d still keep going. A heavyweight clash to warmup the crowd saw a truly bizarre conclusion as in the 5th round of David Price vs. Kash Ali, the two men toppled over together, and it appeared that Kash Ali bit David whilst they were on the canvas. The Liverpudlian, Price landed a heavy right hook which shook Ali, who entered the fight unbeaten as a pro, and forced him to go for the clinch which resulted in a full-blown tackle, and while Ali lay on top of Price, Kash bit David and hard enough to leave a mark on Price’s body. The official result was confirmed as victory for David Price via disqualification. ‘‘It’s a disappointing way to win. He was in the fight and lost his head, but I hurt him to the body…I don’t wanna share the ring with an animal like that again. One of two super-lightweight title fights on tonight’s Liverpool card saw Joe Hughes and Robbie Davies Jr go hell-for-leather for the EBU European and British belts and in what turned into a close shoot-out over twelve rounds, Davies Jr emerged the winner, with the mixed final scorecards coming back as, 118-110 115-113 115-114 all for Davies. ‘‘Just grinded it out like you wouldn’t believe. He was like a pitbull…When you have the British and the European, people take notice. Fighting for the Commonwealth super-lightweight belt, southpaw Philip Bowes improved to 20-3 (3KOs) and defended the rainbow belt for the first time since taking ownership of the title in February with a unanimous decision victory over home fighter, Tom Farrell. Final scorecards were returned as, 118-110 118-111 117-112 all for Philip but it was a lively back-and-forth, if scrappy at times, but the more composed, and measured in his punches-fighter in ‘Quicksilver’ Bowes, saw him get the nod from the judges. Craig Glover suffered a surprise knockout defeat at the hands of the now, 14-7 Vaclav Pejsar of the Czech Republic. Glover, who impressed in his last outing with a stoppage victory over Simon Vallily, hit the canvas twice en route to a second-round stoppage loss, shifting his pro record now to 9-2 (8KOs). Returning to the ring for the first time since her surprise first pro-defeat, Natasha Jonas, scored a 60-54 decision victory over 7-2, Feriche Mashauri. Jonas said she’s aiming for the rematch with Viviane Obenauf next.